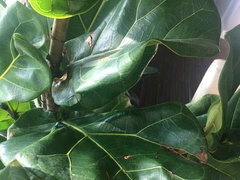 Fiddle Leaf Fig / Ficus Lyrata: Multiple Trunks into One? 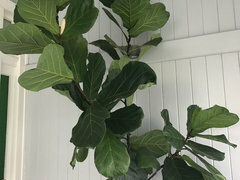 I just got a fiddle leaf fig. As you can see, it looks pretty hearty and healthy. It has three "trunks" that are rather thin right now. I'd like to figure out a way to merge them into one, sort of the like the last photo below. 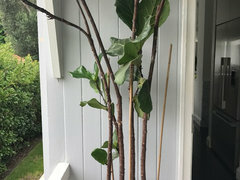 I've read multiple suggestions online: from braiding the trunk together to full-on separating the trunks into separate pots, in the summer, when the season is right and the plant is still healthy. Apologies for posting a question that may have already been answered, but I thought I'd shoot another out there that is a bit straightforward. Thanks. No - no need to redo anything - just be wary of over-watering until you get a chance to do a full repot, hopefully into a medium that allows you to water w/o concern that root function/health might be compromised by long periods of soil saturation. You can pot up at any time, though summer is also a better time to pot up for those a little tentative about doing a full repot; this, because roots will colonize the new soil much faster in summer than other parts of the growth cycle that find the plant less enthused about growing. I'm so grateful I found this thread! Do you have a tutorial for repotting? What medium do you recommend? I'm in Seattle- is June still the best time to repot? 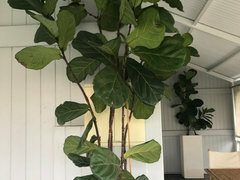 My fig seems to be quite happy in his current home, but I'd like to grow the strongest plant possible, and so far my takeaways are repotting and letting him live outside next summer. Thanks for the kind words, M! You should find this thread about tending Trees in Containers over the long term to be very helpful. It provides a lot of info on repotting. IMO, the delineation point that separates 'good' soils from lesser degrees of comparison lies in whether you can water your plant correctly w/o the plant being punished for it. IOW, you should be able to water to beyond the point of saturation, so you're flushing the soil when you water, w/o need to worry about root function/health being impaired by prolonged periods of soil saturation. I haven't used a commercially prepared medium for anything, not even a part of the soils I make, for more than 30 years. This thread offers an explanation of how water behaves in soils and conceptualizes soils in a way that helps you understand how important soils are to your ability to provide the opportunity plants need to realize as much of their genetic potential as possible. IMO, an understanding of that concept represents the largest step forward you as a container gardener can take at any one time. 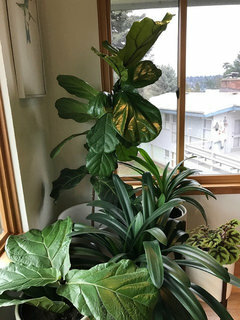 June is the best time to repot (think Father's Day or the summer solstice); and, I'm assuming your plant is a F lyrata (FLF)? Thank you, Al! I'm bookmarking those threads for June. We discuss this topic often. Every leaf is a factory that dutifully turns sunlight, water, and CO2 into the plant's food; so every leaf removed reduces the amount of food/energy available for growth, keeping the plant's systems orderly, and defense. That said, it's your plant and you should do as you wish, but having a good idea of the results of your actions helps you make better decisions. Leaves low on the plant will automatically be shed when they become net users of energy as opposed to net producers. Until that time, they help to thicken and strengthen the trunk so it's self-supporting and so you don't need to 'stake' your plant or tie it together to keep it from flopping over. Weighing that info against your desire for a different look is a good way to determine what your priorities are. There really is no right or wrong action from your/the grower's perspective, but from the plant's perspective, your choice makes a more significant difference. Thank you! So in your opinion, would it be best to let it grow some (I'm guessing this is a younger plant maybe?) and see how it naturally does before doing much more trimming, etc? I am willing to sacrifice the look of it to make sure that it stays healthy, etc. Just mostly wanted to know if trimming the leaves away was a better or worse option than trying to turn it into a single stem. In terms of ho long trees can live, it's an infant; and, what it will do under a given set of circumstances is quite predictable. Pruning a leaf here & there isn't considered serious work, but pruning hard and repotting (more extensive than potting up, as it includes root pruning and a complete change of soil) are serious work. Your plant has natural rhythms that you can take advantage of to minimize the stress placed on the plant by serious work. Basically, repotting and heavy pruning, done around the summer solstice (think Father's Day in the US) is easiest on the plant. There is plenty of info about FLF in the exchanges above if you can afford to make time to read through it. This overview of growing in containers should be helpful. 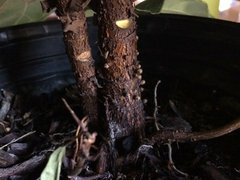 This thread, about growing trees in containers over the long term should also be helpful. 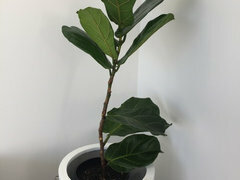 There is also a thread devoted specifically to info about growing Ficus in containers, if you're interested? Thank you! I did read through the thread, but to be honest as a new reader some of it goes over my head! I really appreciate all of your help. 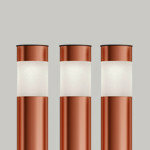 This may be a dumb question, but are there any types of lamp lights that can help give your plant some extra light? 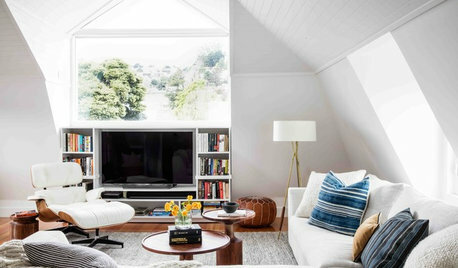 My house unfortunately doesn't have much in the way of natural light so I was just wondering if any lamps you can purchase are good for them. 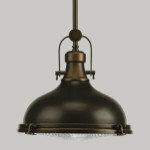 Shop lights with cool white bulbs are good, or CFL bulbs with at least 150w equivalent are good. I'm sure there are good LED lights out there, too. You could probably get good guidance over at the Growing Under Lights forum, too. 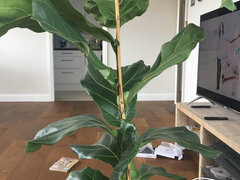 I've had a fiddle leaf fig for a few months now and have just got back from a 3 week holiday. 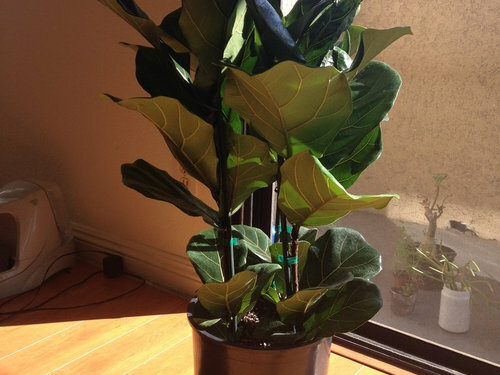 My plant is kept indoors in quite a brightly lit room but not in direct sunlight. 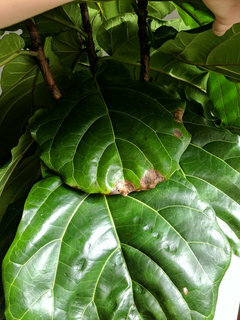 I noticed it was covered in what I believe to be mealybugs which I have tried to remove. I moved the plant into the bathroom to spray with an insecticide and about 7-9 of its lower leaves that still looked health just fell off. Is there anything I can do to come back from this as I was hoping for a more bushy growth rather than a long stalk. I think I can see growth at the top of the plant but can't see any anywhere else. I should also mention that I live in Auckland, New Zealand and it is currently summer and has been quite humid the last week or so. Such great advice on this forum, thank you! 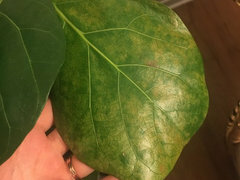 I just wanted to confirm what I think I have learned to be the problem with my 3 Fiddle Leaf Figs. * Ultimately I would like the leaves to be larger and closer together. Assuming that this is would require more sunlight? * One of my plants only has two stems whereas the others have multiple and I had wondered if the plant having to give energy to less stems was helping the leaves to grow larger? * The plants with the multiple stems were becoming crowded and the lower leaves had no room to grow properly. As I result I cut off a couple of stems as the base, is this the right thing to do? I have learned that is important to keep the leaves to thicken the stems, the stems were very flimsy but have now improved. * One of them wasn't looking good - not many lower leaves and flimsy stems. I have cut this back - hoping I have done the right thing! * Ongoing to keep in shape I need to just cut the new growth off the top to keep at the desired height? 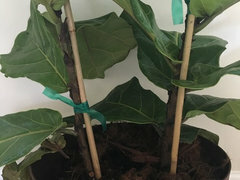 I would like to get more density on the bare stems, does that mean I should cut the stems down to varying heights or it is more a case of needing more sun so that the leaves become denser and larger? * I have had a problem in the past of the leaves growing flat vertically down the stem instead of out more perpendicular to the stem. What is the best way to avoid this? * Re-pot when water runs straight through indicating not much soil or roots are growing out of the pot. * Fertilise yearly (not too often). I have been following the advice on this forum for a couple years now and can not thank enough for helping me successfully flush, re-pot, and propagate my FFL! 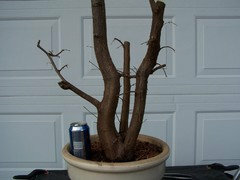 That said, I am struggling with pruning and notching. I understand the process, I've notched apple. plum, and a loquat with success before but something is just not working to get my happy single stem to branch. The first cut, above two leaves at approx 30" (2+ years ago). 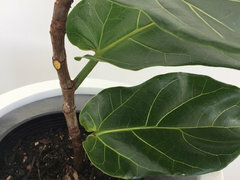 There are a series of smaller leaves above the cut. I tried notching here without success. 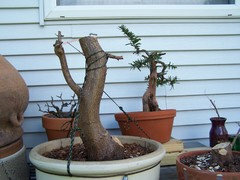 To restrict height, I pruned the tree again this fall and notched the plat below to stimulate growth of a branch. The second cut is at approx 43" and the new stem off of the top now has three healthy leaves. I'm clearly missing something with the notching here and am willing to try again this spring. Where would you recommend I cut and notch this time around? Would it make sense to cut lower, near the 30" cut and notch from there to try to achieve balance and stability? Or, given the size, is there a better solution? bushy growth rather than a long stalk. What did you spray it with. 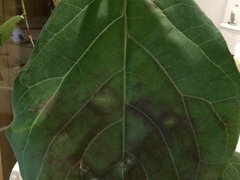 Do you have the sense that the leaf loss might have been caused by what you sprayed with, or do you think the plant was well along the way toward shedding of the leaves before you sprayed? If it was my plant, I'd cut it back now, move it outdoors into open shade to start acclimating it to full sun, flush the soil very thoroughly, fertilize, and monitor water needs carefully until you get into an appropriate rhythm. I'd also think about repotting as soon as it starts pushing new growth with some seriousness. That would be the general guideline. I realize it doesn't provide you with any specifics, but I'm always willing to answer questions and offer guidance to anyone who has interest in making their growing experience more rewarding. Let's see what you offer in the way of reply. 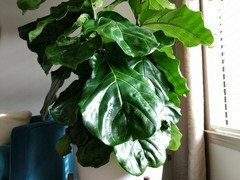 Jolie said: I just wanted to confirm what I think I have learned to be the problem with my 3 Fiddle Leaf Figs. * Ultimately I would like the leaves to be larger and closer together. Assuming that this is would require more sunlight? More sunlight = shorter internodes and smaller leaves, so it's unlikely that you'll get both wishes in the measure you're looking for. Switching to a fertilizer that utilizes urea as its N source will increase leaf size (over fertilizers utilizing nitrate sources of N), but unfortunately it also stimulates long internodes. 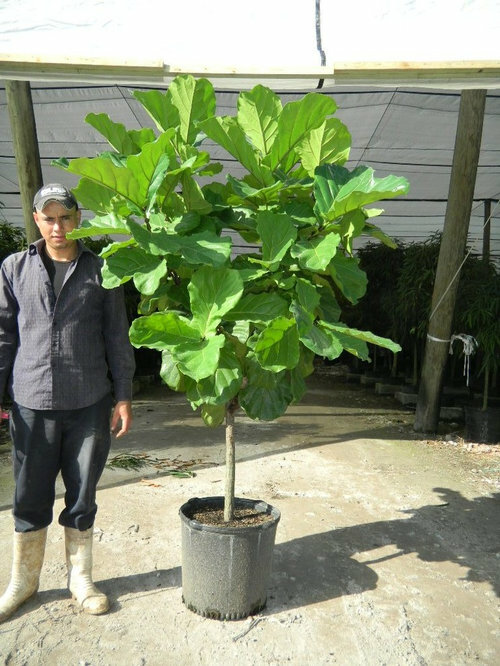 There is much to be said about reducing leaf size on large-leafed containerized trees so they're more in proportion to tree size. I would set my sites on letting leaf size end up wherever it ends up and focus instead on increasing the number of leaves on the plant through attention to pinching to promote ramification (more branches & leaves). 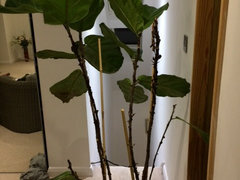 stems was helping the leaves to grow larger? 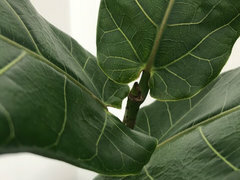 There is a genetic trait locked in the DNA of plants in the Moraceae family that dictates that as branches extend and leaves are added, each new leaf is larger than the previous leaf added, at maturity. If you learn how to pinch correctly to promote ramification, you'll be letting each branch grow 3-4 new leaves before cutting it back to the 2 smallest leaves on the branch, which were the first to appear on the branch and the smallest of all leaves that would have appeared on the branch. fruits, leaves, stems, roots. In the end, the planting with the most leaves will grow the most. Growth isn't measured in how much branches and stems extend, it's measured by the increase in the dry weight of a plant. It's common for growth to be in the negative column even while branches and stems are extending. stems were very flimsy but have now improved. You're correct in that belief, and I'm glad things have improved. stems. I have cut this back - hoping I have done the right thing! 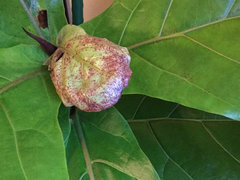 I'm a strong advocate of looking at plants with an eye that analyzes how the plant looks now and how it will look in the future w/o intervention by the grower; then taking action to remedy things that reduce eye appeal in the immediate AND heading off those things that will be problems before they get to 'problem' stage. IOW, that the plant grows it is not a sound reason to keep it. The sooner you prune out the problems and head them off, the less drastic action any future remediation will require. Don't let your trees be the boss. You'll need to take a hand in how they look/develop or you're very likely going to be disappointed. become denser and larger? Multi-stemmed plantings look best when there are 2, 3, 5, 7, or 9 stems that look randomly planted in the pot. After 9, your eye can't tell the difference between odd & even numbers of plants. You should choose the thickest stem to be the tallest, next thickest maybe 2/3 as tall as the tallest, and the thinnest about half as tall as tallest for best appearance. If you're interested in how to achieve any goals that involve pruning - just ask and I'll tell you how/explain the 'whys' of it. vertically down the stem instead of out more perpendicular to the stem. What is the best way to avoid this? 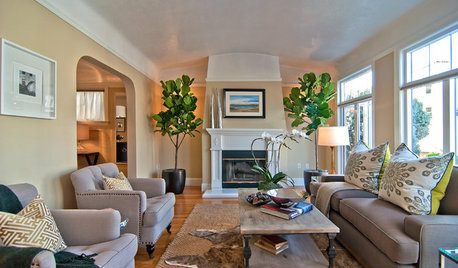 Best way to avoid it is to avoid putting your plant in a predicament likely to cause wilting. This means it's important to maintain an appropriate moisture:air ratio in the soil. 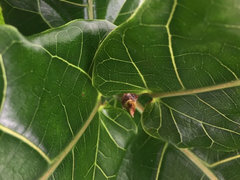 Both over and under-watering create the same inability to move water efficiently, so both cause wilting, and F lyrata is one of those plants with leaves that often cannot return again to their original spatial position after wilting. 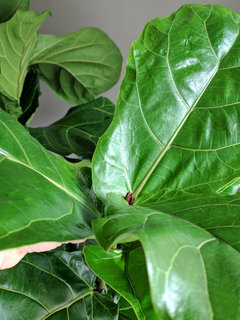 You might say that when lyrata's leaves wilt, they can 'take a set' in the wilted position from which they cannot recover completely. * Re-pot when water runs straight through indicating not much soil or roots are growing out of the pot. 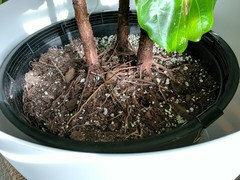 I'd say that repotting at the first appropriate opportunity after the root/soil mass can be lifted from the pot intact. This will end up being every 2-3 years if the plant is kept reasonably healthy. Very healthy plants would benefit from repotting every other year, but you'll need to weigh the effort against the loss of potential if you wait the extra year. There is a significant difference between repotting and potting up, btw. * Fertilise yearly (not too often). I fertilize in winter every time I water, and weekly in summer when temps are in a range that makes it appropriate to fertilize. No one can offer meaningful advice about how to fertilize effectively w/o knowing how you water and a good idea about what the soil characteristics are, relative to drainage, aeration, and water retention. Keisner - Thanks for the kind words. I think you'd be better served if you work toward getting your tree in a high state of vitality when it has plenty of energy reserves and cut it back. This will be in early summer sometime. Then start a pinching program on all the new branches. Pinching out the apices reduces the flow of auxin, which inhibits natural back-budding. If all 3 of the growers start learning how to guide their trees to how they want them to look, they can easily achieve their styling goals. Once you start pinching a plant religiously, the only real pruning you'll need to do is removing problem branches or branches that detract from the planting's eye appeal, and some thinning. As long as you can provide cultural conditions that allow your trees to remain healthy, they'll do the rest. Hi Al! 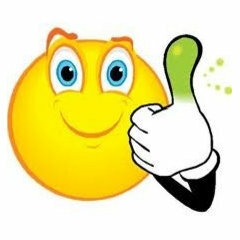 You have helped me in the past with great success. Can you tell me what's happening with my plant? Every now and then I will get a funky leaf like this ... But this time, budding three ugly ones! It's really common for leaves to look like this in winter while dealing with cooler temps and low humidity. 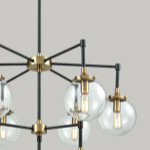 Unfortunately I did not get your comment until now about my fig. I think it was on the way to shedding before I sprayed the plant. I used the spray in the photo attached. 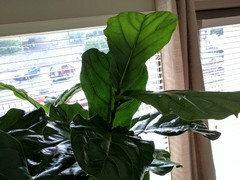 The plant is now down to three leaves so I don't know how I can save it. By cutting it back what do you mean? How far back do I cut it? I'm a real novice when it comes to this sort of thing. I also don't know what you mean by flushing the soil? Also I can't see any new growth. Would this just come out of the top of the tree. Or would the leaves that fell off regrow at all? Al (tapla), a huge thank you to you. I have taken your advice and can see a huge difference in my figs in a matter of weeks. Will post before an after pics when they really take off! Hi, Grace - Really sorry to learn your plant is struggling. ANY time you have a plant that's failing, the best way to view the o/a situation is from the perspective that the plant is being asked to deal with conditions it's not genetically programmed to tolerate (too hot/cold, too dry/wet, too much/little fertilizer ......... Our only job as growers is to figure out what is causing the limitations, then fix it, or to make sure we eliminate the potential for limitations before they become limiting. The best way to do that is by making sure you have the basics covered. If you can provide a favorable amount of light, the right temperature range, and keep the root system happy, your plant will perform well and look good. 2 of those 3 basics, while extremely important, don't require a lot of discussion. Working on light and temperature to the best of your ability leaves the discussion focused on root health. In the end, at least 95% of the issues that center on a plant's vitality, center on root health. If there is one self-evident fact governing plant husbandry, it is, 'You can't expect to produce a healthy plant if you can't provide what it needs to grow a healthy root system'. Even a plant's ability to defend itself against insects and diseases depends on a robust metabolism, to which a healthy root system is a prerequisite. 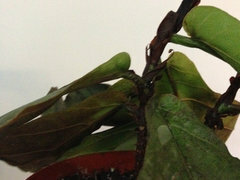 C) Monitor the plant's water needs carefully and only water when it's apopropriate. I know you'll benefit if you read about How to Turn Struggling Plants Around which the link will take you to. There is a lot of step by step info there, including how to flush the soil, that will provide an outline you can use to help your plant recover, but the 6 steps I outlined would serve very well as your focal point. Jolie - You're welcome; and thanks for the kind words. It's always good to know something that was suggested is working, but getting a sense of enthusiasm from those you've tried to help is really rewarding - so thanks for voicing your thoughts! Thanks for the advice Al. You'll be pleased to know that my plant has sprouted new growth! You're right, I am pleased to learn your plant is gathering momentum. Strong work! Best wishes for continuing success. Hi there! Any idea why my leaves are looking like this? 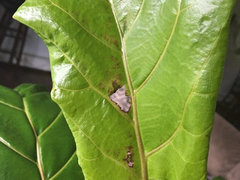 The first picture looks like it could be cold damage, late result of sunburn, or contact with something topically phytotoxic (as in something may have found its way onto leaves that killed the tissue). There are a lot of different strains of mosaic virus, and the second picture sure looks like one of them. I'd remove and destroy that leaf. Put it in a plastic bag and in the trash. Wash your hands after to prevent infecting more plants. I am hoping you are still around on this thread and can help me with my tree. 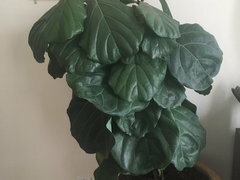 I just got it today, but many of the leaves have dry/crunchy brown spots on them. What do you think this is from and what is the best way for me to remedy this? 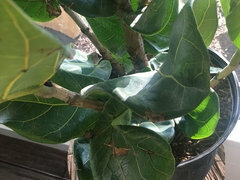 The trunk seems woody and firm and the leaves feel strong apart from the brown spots. Thanks for all of your willingness to help us out! 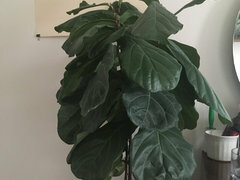 I have read through all of the super helpful info in this thread and got tons of tips to take care of my plant. I have had my Ficus for 3 months... where are two plants in one pot. The pot size is 5 1/2" tall and the diameter at the top is 6". After reading the tread about I believe I did overwater a bit. However... the one plant is looking fine and growing new leaves often while the second plant is looking very brown and shrivelled. I am confused... they are in the same pot and one is doing great while the other is looking so sad. Should I remove the leave or remove the sad plant all together? 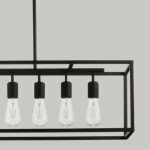 or do you want a composition that actually DOES have only one trunk? 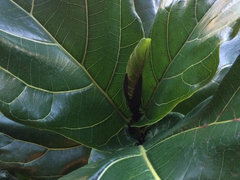 My perspective re F elastica and lyrata is that they both have leaves so large they end up being an impediment to the grower's ability to create a composition with leaves in proportion to the o/a size of the tree. No one should allow that idea to diminish the fun or satisfaction of growing a healthy plant of either species, but something like F retusa or benjamina would be much easier to mold into a more proportionate tree. I DK if you've read this anywhere here, yet, but after you water to beyond the saturation point, hold your plant over the sink and move it downward then sharply upward. As you transition from down to up, the water in the pot will want to maintain its downward inertia. You can rid even VERY water-retentive soils of all their excess water by employing Newton's First Law of Motion as described. At a minimum, this allows you to flush the soil of accumulating salts any time you like, as long as the plant/pot/composition is light enough to easily manage. Even when it becomes so large it's difficult to manage, there are other tricks that directly employ science to work on your behalf to ease the limitations of poor drainage/aeration. 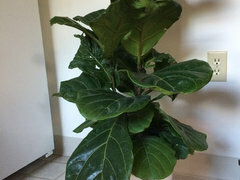 Hi Al, I've been reading through this forum and wondering if I could also ask for your advice as I am struggling with my ficus lyrata. I bought it several months ago now from a nursery, and I have had no growth from it at all. 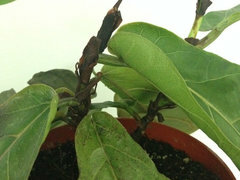 There is one bud at the top which has been like that for several months but never spouting a leaf. (1st picture below). I am not sure why there has been no growth in all the time I have had it. I repotted it thinking that might help but realised that that was maybe unnecessary. Thank you Al! I would like to keep both trees. Will the one with brown leaves still survive if I let the plant dry out and water it less? 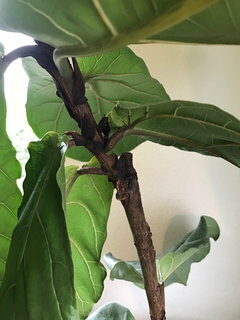 The healthy plant is continuing to shoot new leaves but the one with brown leaves isn't showing any signs of new growth at the top. Needing some help. 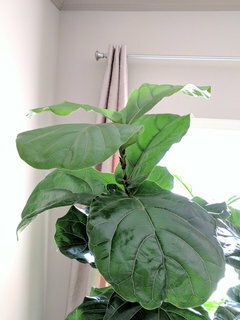 I have a new leaf on my FLF that looks odd. Any insight? 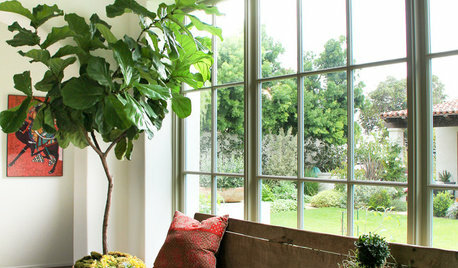 Ash - I would get your plant in front of a bright window, flush the soil the next time it needs water and fertilize at that point. I'd recommend a recommended concentration of Foliage-Pro 9-3-6. After that, monitor water needs carefully and only water when the soil is about to become dry to the bottom. You want to water immediately before the soil becomes completely dry deep in the pot. Jhick - It's not unusual for one of 2 or more cuttings in the same container to simply give up spontaneously/idiopathically. It happens. I can't say what went wrong, or whether the plant will make it. Just provide conditions the plant likes and wait to see what develops, or doesn't. 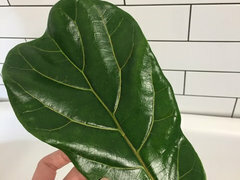 Ralphenia - If it's a fairly new leaf that emerged while central heat or air conditioning was in use, it's likely due to low humidity causing the leaf to stick to itself and tear as it unfurled. Can't add more w/o more info. 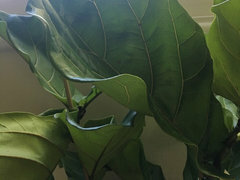 Is it normal to lose a few leaves from the bottom of the plant if those leaves are blocked from the sun? Two of the three plants are growing, but the third is not. Should I be worried? And if so, what should I do to fix it? 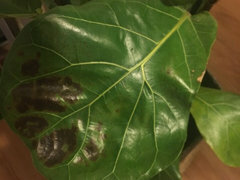 Last, if you can tell anything from pictures, I'd love a general health assessment on my plant and advice about what I should do moving forward. It's been in pretty much that same spot for about a month and a half. I water it when the top ~1-2 inches of soil are dry and I just start to see the leaves droop a bit--about every 7-9 days. I set the plant in a plastic tub, water it until water starts to run out the bottom of the nursery pot, leave it for a minute to make sure everything has drained, and then put the pot back into the planter. I also rotate it 1/4 turn every week. 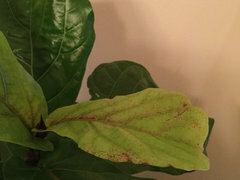 I know leaves can brown and fall off from over-watering-- do you think that is the cause of leaf loss on my plant, or are they falling off because the leaves just aren't getting enough sun? And what causes the leaves to point downward? 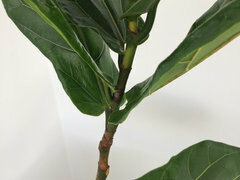 Since I got the tree, two of the three stems have each grown about a foot, adding 5 more leaves (3 on one, two on the other). What could be causing the mismatched growth? Do I just need to be more patient, or does the pot perhaps not have enough room for all three to grow? I haven't re-potted or fertilized the plant out of fear that it would be too stressful this soon after taking it home. But I've also read that this time of year is the best time to do so. If it is overcrowding, which is worse? 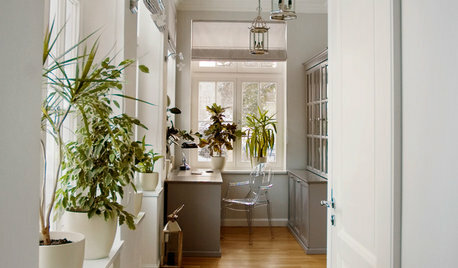 Leaving the plant crowded for another year, or stressing it out soon after a move? 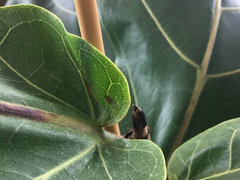 I want to help my beautiful fig tree thrive, and I've done a lot of research (thanks largely to this forum!). But, I would appreciate any insight you have about how my plant looks now, and what (if any) changes I should make. 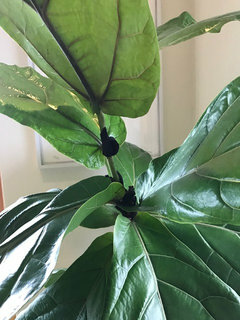 Is it normal to lose a few leaves from the bottom of the plant if those leaves are blocked from the sun? Plants are reactionary organisms that respond to cultural stimuli in fairly predictable ways. Anything they do then, is normal. A minimum flow rate of a hormone (auxin) that's produced in most tissues, but primarily in meristematic and leaf tissues, is required across a zonal area at the base of each leaf stem. The zonal area is called the abscission zone, and once the flow of auxin drops below the minimum required, a corky layer forms in the zone that cuts off water and nutrient flow to the leaf and photosynthate (food/sugar) to other organs. 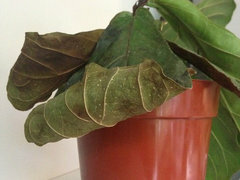 The abscission layer is not reversible and causes shedding of the leaf. There are several conditions/stimuli that can limit the flow of auxin, and a significant decrease in light levels, for any reason, is one potentiality. Two of the three plants are growing, but the third is not. Should I be worried? And if so, what should I do to fix it? Plants that are not growing are dying. This can be said because plants that are making more food/energy than they are using are always growing, and plants that are using more energy than they are making are not growing or actually losing weight through shedding of parts. Increase/decrease in dry mass is the true measure of growth - or how far a plant has backslid. From this, you can see there is cause for concern, at least for the plant that isn't growing, and probably for the others as well, seeing that all share the same cultural conditions. forward. 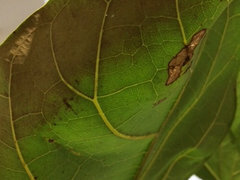 A couple of images showing individual leaves with some necrotic areas seem to indicate some periods of over-watering, but nothing too serious. I think the best advice anyone can give as a starting point is, make sure your plant is in a soil that allows you to water correctly, that is to say, to beyond the point of saturation, so you're flushing the soil of accumulating dissolved solids (salts) when you water. Of course, that requires you to acquire some basic information about how/why water behaves as it does in soils. An appropriate or highly appropriate soil makes maintaining good root health soo much easier, and a healthy root system is a prerequisite to a healthy plant. One can't be had w/o the other. It also makes fertilizing (a crucial consideration) monkey easy. Beyond that, light levels and temperature are also a big part of maintaining plants at a high level of vitality. should answer a lot of questions. If after looking it over you have other questions, don't hesitate. Thanks Al! I have read through the basic overview, which is how I found out about the soil mixture you recommend. Since I've only had my plant a month and a half, I guess my question is: which is worse--potting it into new soil and risking stressing it out more, or leaving it in the soil it's currently in? Also, would you recommend potting up a size or just trying it in a new soil for now? Last, I still have questions about why all my lower leaves point downward. 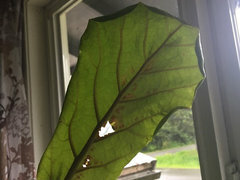 It was like that when I got the plant, and I'm worried that is at least part of the reason some of the lower leaves are shedding. Is there anything to do to reverse this? 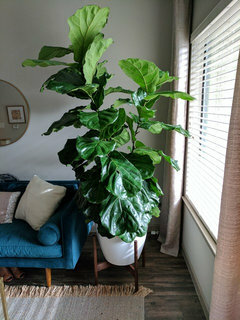 I just bought a FLF from home depot. The gardening expert who works there gave me 50% off the tree because he said none of the FLFs that he has are doing very well. It was only $10 so I decided to get the tree and take a chance on making it happy and healthy. Since he said the other plants aren't doing well, I was thinking I would repot like you recommend (not pot-up), get a completely new soil, and start from scratch. I read through most of this whole thread and what I've learned is to use a soil that doesn't retain water, has large particles, and allows aeration in the soil. 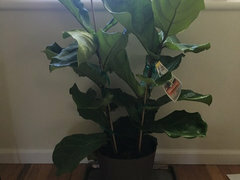 I'm pretty new to houseplants so is there a soil you recommend that fits those requirements? I'm assuming you don't recommend putting stones in the bottom of the container? I was thinking of repotting the tree into a medium container with only soil in the container and holes at the bottom for drainage, then putting that container into a bigger, ceramic container with stones at the bottom. That way the soil doesn't collect water at the bottom, and there's a place for the water to go after watering. I live in a pretty dry area (Sunnyvale, California) and thought this would also help with humidity as well. What are your thoughts? There are two trunks in the pot I got, both of which are about 3 ft tall with no branches. Eventually, I'd like to mold them into a tall tree shaped plant. I know this takes a long time, which I'm willing to invest in. 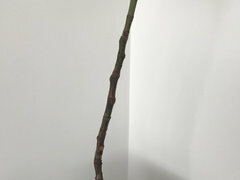 I was wondering if the best plan to do this is to separate them into two separate pots, or to bind the two stems together to make one thicker trunk. Also, in order to encourage branching, I read that notching can be done, but I've never done that before, so is there a link you can give me with more information about that? Last question is about the leaves themselves. The plant overall seems to be doing pretty well, but I have noticed that most of the leaves are curled at the edges instead of being flat. Is this normal? If not, what can I do to fix it? Thanks so much in advance. I have learned so much already from you just by reading this feed and your attached articles, and I'm looking forward to learning more! 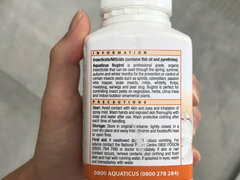 recommend putting stones in the bottom of the container? Using things like gravel as a "drainage layer" causes water to perch in the soil above it. 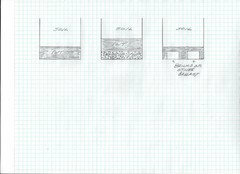 The first image (below) is where the perched water resides in a planting w/o a drainage layer when using soils that support perched water. The middle image illustrates how water perches in soils above a drainage layer, and the last image shows how you can use rocks, bricks, empty soda bottles with lids on, as ballast. You can see that the ht of the PWT is the same in all 3 cases, but there is less soil capable of holding perched water when you use ballast. You can do away with at least 95% of your soils ability to hold perched water if you use ballast judiciously. container into a bigger, ceramic container with stones at the bottom. as well. What are your thoughts? 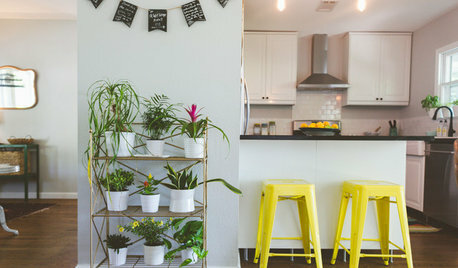 That arrangement can be beneficial in some ways, but it doesn't do anything to increase drainage or decrease the amount of excess water your soil can/will hold. one thicker trunk. You can still create a single tree image when more than 1 or 2 trunks are part of the composition. ^^ Two trunks - looks like 1 tree. link you can give me with more information about that? I think I'm going to have to write something about notching and save it as a word document ..... the subject comes up so often. can I do to fix it? I wouldn't say it's abnormal. In some plants, it's a reaction to very strong light; it can be related to nutrition; and, it can also be a genetic trait. forward to learning more! Those that invest some time in finding reliable information that directly helps them identify and eliminate those things that are limiting their plants, leave the trial-and-error crowd standing in their slipstream; so, even if I tried, I couldn't overemphasize the value of gaining knowledge ant then using your practical experience to validate what you already know. It's more productive by an incredible margin than trial and error. This is mainly true because in most cases, a good measure of knowledge is required to interpret the results of your trials & errors. If you misinterpret the results of your trial & error efforts gone awry, your efforts are wasted ..... at least from the perspective of learning something. Dang it, Al, I thought I saved the stuff I found recently about notching after I did a search to help someone else, but I guess I didn't, probably because it's not something I need to do. Chloe, if you enter the word "notching" in the search box at the top of the page you should get threads where Al has posted full explanations of how notching works and how to actually do it. Scan through the short thread above. Most of the info re notching will be found in the last post. 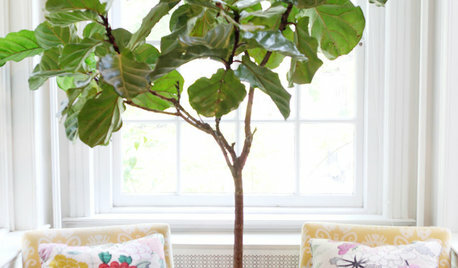 I have a fiddle leaf so similar looking to Ms. Catherine Cocose's above photos that I'm not even going to post a photo! Mine, like hers, has a trunk that bifurcates at the very base. There is a taller trunk and a smaller trunk that is about 3/4 the size of the larger. I would like to have a tree with one trunk. 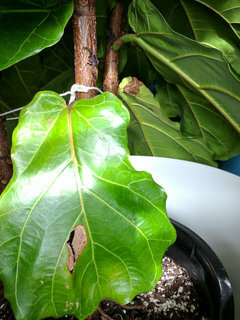 2) Can I encourage the cut trunk to root? How do you suggest I do this? 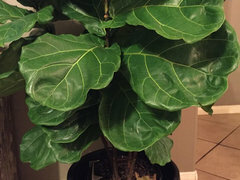 Decided to add photos just in case :) she has been very happy since I brought her home 2 weeks ago, even sprouting a new leaf on the larger trunk. Hi everyone. 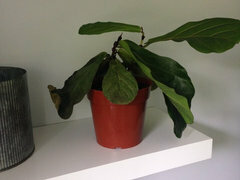 I'm wondering can I get some advice on my ailing plant? I repotted it about a month ago and this past week it's flopped to one side and gotten incredibly droopy. I think it's safe to say I did a bad job repotting it. Now I don't know whether to try again or let it recover? I'm worried it will die if I do nothing. About three leaves have dropped from the bottom so far. Audrie - there are 3 ways to make a single trunk from your plant. 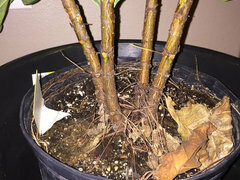 A) cut the smaller trunk off immediately above the root to shoot transition and rub off all/any buds that break back near the wound site. B) Split the 2 trunks apart by making a vertical saw cut between the 2 trees. If there are 2 plants, there's a possibility you can pull the 2 trees apart, but you might need to remove some roots that are fused or that lock the tree together in something similar to the way animals in the Cervidae (deer) family might lock antlers. If you're inclined toward saving both of the individual trees, before you make the saw cut, determine that there is a volume of roots attached to both plants sufficient to ensure viability. There is no need to have a ton of roots on the smaller plant because that can be pruned back to the root to shoot ratio is appropriately balanced. C) Wrap the trunks together very tightly with grafting tape or 2" vet wrap. You'll be leaving them wrapped tightly until at least next fall. By then they should be fused. Eventually you'll cut the subordinate trunk back to a leaf growing away from the center of the composition, and instead of the trunk competing for your eye as the apex, it becomes a branch. You can see what I mean in the mother/daughter composition below. As you can see, there is no need to fuse the smaller trunk or remove it. Leaving it as is and pruning it as I described will solve the issue. You'll still have 2 trunks, but they work together to make a composition that will appear to be a single tree. Rachel - you can straighten the tree by digging out some of the siol on the tide it should tilt toward. Then, just grab the trunk and guide the root mass with your hands and reposition the tree in the pot, then backfill with appropriate soil. You can tie a rope around the pot just under the rim, then tie one end of another rope to the trunk opposite the way the tree wants to lean, and the other end gets tied to the rope encircling the outside of the pot. See the hornbeam I dug from a raised bed last year. 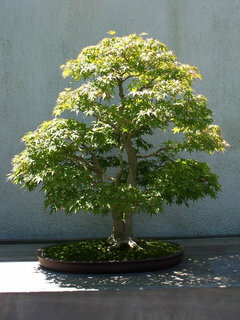 It's at the very beginning of being trained as a future bonsai. Note how it's secured in the pot. I did this because I hauled the tree 103 miles (one way) to get input about from other bonsai practitioners whose opinions I value. Originally, it had 3 trunks. Thanks Al, I will do that! Is there anything I should worry about with the dropping leaves? 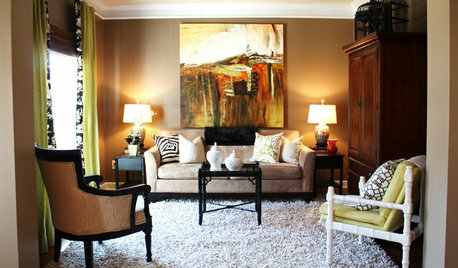 Do you think repositioning the tree will make it happier? R - there is always 'concern' when a tree is pitching a chronic fit and throwing its leaves on the floor. Growing well is a holistic thing, and you can bet all that Mother Nature is going to side with the hidden flaw. IOW, that factor that is most limiting might as well be the only thing that is limiting the plant's vitality. When you fix the most limiting factor, the factor that had the potential to be the second most limiting factor becomes THE most limiting factor. If Joe wants to be a tennis player, but Joe's blind, it's a good bet the lack of ability to see might be the factor most limiting his potential. If he suddenly/miraculously has his sight restored, the fact he was born with only one leg could easily become the NEW 'most limiting' factor. If Joe gets fitted with a new prosthesis, the fact that Joe weighs 450 lbs might become the next most limiting factor ....... and so it goes with plants. There is actually a Law, called Liebig's Law of the Minimum that addresses and fleshes out this concept. So, if light is an issue and you fix that issue, if the next most limiting factor is a near equal to the limitation imposed by poor light, it's not in the cards that you'll see a significant improvement. I frequently explain that what determines out proficiency as growers is how well we identify what is limiting our plants, and how effectively we eliminate or reduce to the greatest degree possible, those limiting factors. Unless we have a good idea what else has the potential to be almost as limiting as the most limiting factor, we can't even make an educated guess as to how much impact getting the light right is going to have on moving the plant in the right direction. ALL pieces of the puzzle are relevant and important. What I said should be read as encouragement to keep focusing on learning all you can about potential limitations and developing strategies to eliminate them. Knowledge will carry you further and faster than years and years of accumulated experience gained by trial and error. Thanks Al, happy to report it's doing a lot better this week! Rachel, that's great! Did you do anything else to help it along, other than straighten it? I replaced the soil that I dug out and added more in general, I realized it wasn't being supported as well as it could be. I also mixed in some perlite. I guess it was really just struggling before so some small changes made a lot of difference? Back to my favourite thread with another question! I'm moving apartments this week, which means figuring out new spots for approx. 35 plants. 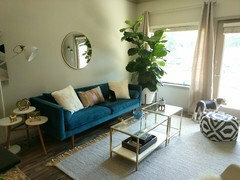 It shouldn't be an issue for most of them, but I am concerned for my fiddle leaf. We have two window aspects -- north and south, but here's the rub. I spent the whole day there yesterday cleaning, and noticed that the north-facing room was generally brighter all day, which I suppose is because the south side has a lot of tree coverage and two buildings on either side that are deeper than ours (joys of NYC). Anyway, it still surprised me. I assume there will be some trial and error involved, but where do you think I should start with the plant? I've read conflicting accounts of the success of FLFs in a north-facing windows, so should I see how it goes on the south side first? 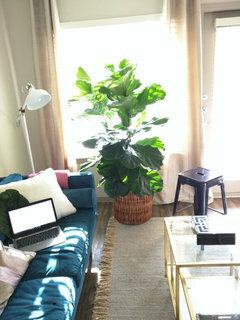 So I got a fiddle leaf fig tree! 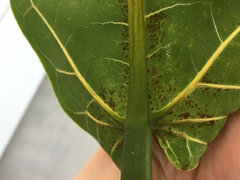 What are these spots on the branch of my fiddle leaf fig? What’s wrong with this dracaena?